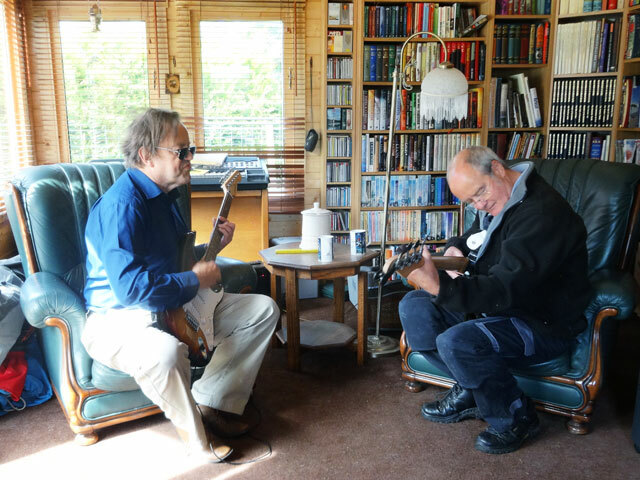 David, a friend of Tom’s, came to visit us today and, while we had coffee in the summer house, the guitars came out and I was treated to some of the great music from my youth – the Shadows, the Beatles, Led Zeppelin and so much more. Fabulous! Up and walked Mix before breakfast in the farmhouse. Met up with Tom and soon afterwards David arrived. Not only a great guitarist, David was able to help us plan the provision of services for the other barns. It is a Godsend and I am extremely grateful. Tom went off for lunch and David and I blethered over another coffee before I spent some time on the telephone to Lynne, a student who is preparing a dissertation on pilgrimage to and around the islands of Scotland. It sounds extremely exciting. I gathered together some material to send to her. Now it was time to cut the grass so, you guessed it, the beautiful sunny day suddenly turned into a wet one. Still the shower was short-lived and soon it was back to really warm, bright sunlight. I got the grass cut and then spent some time reading before walking Mix and feeding him before we went across to the farmhouse for supper. Everyone has been out and working in the garden today (Olive was also freezing fruit and Mum was also washing and ironing) except for Rachel who has been working on the music for Gavinton next Sunday. In the evening I worked at my desk in the summer house and then watched the news before bed time.